Bremen is the city where sophistication meets innovation. It's simply impossible not to feel the dazzling life force in Bremen. Once you visit this gorgeous city, whether on business or for pleasure, you are sure to find it impressive! In any direction you look, you can see a landmark or a building of great significance! 8Rental wants to remind you about some of the most remarkable places of interest in Bremen you will probably feel happy to see. These are Schnoor Viertel, Marktplatz, Historische Altstadt, Bremen Town Hall, St. Peter's Cathedral, Bottcherstrasse, Muhle am Wall, Glockenspiel House, Kirche Unser Lieben Frauen. 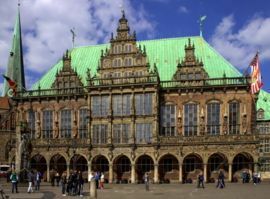 Bremen is one of the most popular German cities that attracts specialists interested in science, space, and high-tech. Most travelers visit this city in groups. To get a comfortable and reliable transportation in this wonderful city, it's enough to rent a van with a driver in Bremen from 8Rental. 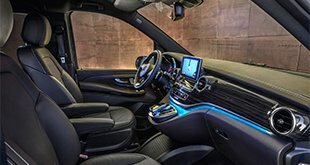 This is a leading European car supplier you can turn to whenever you are heading to a European city. 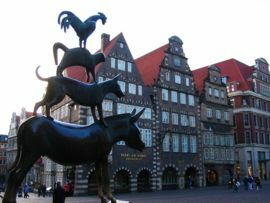 Book a minibus, enjoy every minute spent in Bremen as 8Rental promises unforgettable experiences! By the way, by booking a van from 8Rental, you get the chance to be met right at the airport or railway station - the option is yours! Choosing 8Rental as your official transportation means in Bremen, you will greatly benefit! Besides being provided with a professional driver and an amazing vehicle, the fuel, and insurance are included in the offer. Despite the fact there has not been registered any accident with the participation of a driver, working for 8Rental, we do provide free medical insurance for all of our customers. Moreover, all taxes and fees are under our responsibility. In case you have additional requirements, feel free to inform our customer service operators. We shall do everything possible to make your driving experience in Bremen simply fantastic. 8Rental is available 24/7 and waits for your completed quotes! Would you like to rent a compact minivan to drive up to eight passengers in complete comfort? We advise you to book a Mercedes Viano at the most convenient conditions. The driving in this vehicle your entire group will feel wonderful. It's equipped with such amenities as air conditioning, air suspension, central heating, seat belts, tinted windows, and others. The model is great for those who are traveling on a limited budget. Hence, numerous companies will find it beneficial to hire this van with a driver in Bremen for their employees' business trips. Anyway, those groups who have larger budgets can hire the V class minibus. Other minivan models 8Rental can offer to its clients for rent are the Mercedes Sprinter and Sprinter VIP class. These are significantly more capacious than the previously described ones and look not less attractive. They have elegant exteriors and advanced specifications. Our clients' safety is a priority for 8Rental. 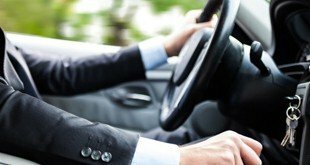 Therefore, it employs exceptionally experienced and skillful chauffeurs. All of them are licensed and are ready to serve with a high sense of responsibility. All our faithful customers rely on our chauffeurs and always leave exceptionally positive reviews. If you wish to experience yourself how wonderful it is to sit back comfortably in a premium vehicle and enjoy safe driving along Bremen's roads, booking a van from the service is more than enough! Additionally, before hiring a van, remember to mention all your requirements concerning the driver that will serve you. Our drivers speak not only German but also a series of other European languages including Russian, Italian, French, English, and others.